A century ago, packs of African wild dogs more than 100 members strong roamed free on the Serengeti Plains. 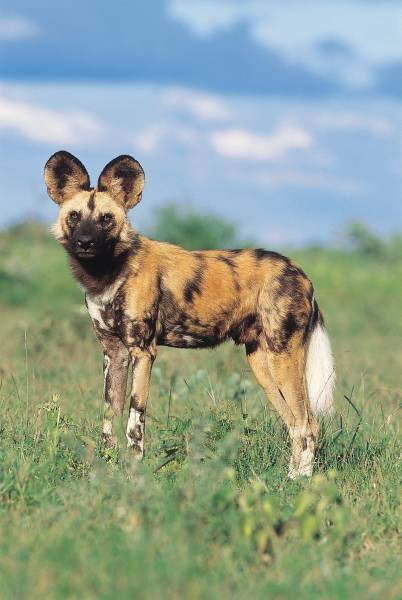 Over time, African wild dog populations in central and northeast Africa were wiped out, and across Africa their numbers continued to decline, earning these canines an endangered status. Today, fewer than 5 000 dogs live behind fences in African reserves. The good news for visitors to Madikwe Game Reserve is that highly endangered African wild dog packs are flourishing here. A founding group of six African wild dogs was introduced to the Reserve in 1994. Despite lion attacks and rabies outbreaks, the pack slowly grew and established a resident clan. 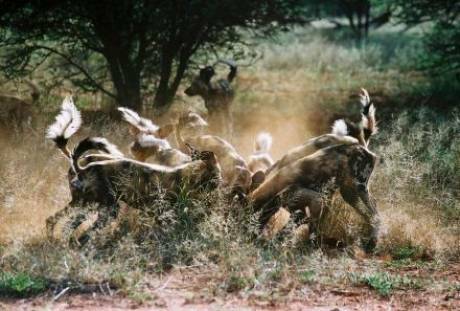 Today, a wild dog hunting pack thrives in Madikwe Game Reserve. African wild dogs are extremely active and need to average a kill a day to keep their energy levels up. Excellent hunters, they target prey cooperatively in packs, using stamina rather than stealth, and communicating using a range of vocalisations, including a short bark of alarm, a rallying howl and a bell-like contact call. After singling out an injured or old animal in the herd, the hunting pack will boldly approach. As the herd stampedes, the dogs will chase down their prey. African wild dogs have been known to pursue prey for more than an hour, using the white tips of their bushy tails as flags to keep the pack in contact. The hunting clan will eat the prey on the spot and then return to the rest of the pack to regurgitate food for the young and injured.